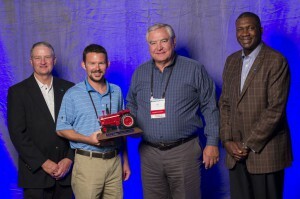 DES MOINES, IA – Ryan Justus and Rex Rider of Premier NW Insurance, with offices in Salem, Clackamas and Sandy, were recognized at the Nationwide® Agribusiness Insurance Company national sales conference held in Las Vegas, NV as among the company’s leading writers of farm insurance. The agency is an On Your Side® Farm Certified Agency, a designation which recognizes their skill and dedication to the farming industry. The annual FAST Track Conference was held in recognition of top-producing agents in sales of new farm insurance policies during 2012. While more than 9,300 agencies write farm insurance for Nationwide Agribusiness, only 94 qualified for the 2013 FAST Track Conference. Nationwide Agribusiness Insurance Company, and its affiliate, Farmland Mutual Insurance Company, are part of Nationwide®, Columbus, OH. Nationwide Agribusiness, rated A+ (Superior) by The A.M. Best Company, is the country’s #1 farm insurer, and a leader in insurance and risk management solutions for commercial agribusinesses in the food and fiber chain. For more information, visit www.NationwideAgribusiness.com. Nationwide Agribusiness offers the AgriChoice® farm policy which provides customized coverages for farm operations of various sizes and types. Nationwide, the Nationwide Framemark, and On Your Side are federally registered service marks of Nationwide Mutual Insurance Company.